in the North of England Championships, with mixed results, but playing lots of tennis against many schools who we don’t normally play on our tennis circuit. and a very good practice ethic. Other senior players include Lucas Powell, Piers Smyth, Archie Bayston, Tom Read, Robbie Rix and Majid Panahi, who all should be available next season. The junior teams played matches against Ampleforth, Ashville, Barnard Castle, Bolton, Bradford Grammar, the Grammar School at Leeds, Manchester Grammar, Newcastle School for Boys, Pocklington, QEGS Wakefield, RGS Newcastle, Sedbergh, South Hunsley, St Mary’s, St Olave’s, St Peter’s, Wolfreton School, Woodhouse Grove and Yarm. South Hunsley, giving them experience playing the game at an inter-school competitive level. 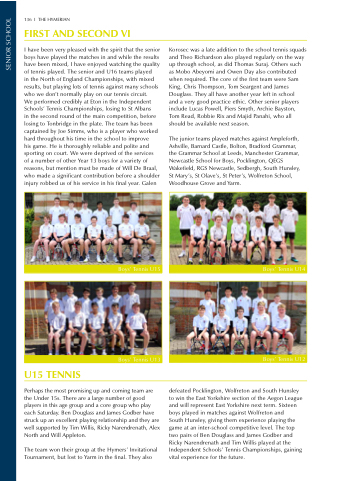 The top two pairs of Ben Douglass and James Godber and Ricky Narendrenath and Tim Willis played at the Independent Schools’ Tennis Championships, gaining vital experience for the future. Perhaps the most promising up and coming team are the Under 15s. There are a large number of good players in this age group and a core group who play each Saturday. Ben Douglass and James Godber have struck up an excellent playing relationship and they are well supported by Tim Willis, Ricky Narendrenath, Alex North and Will Appleton.